We work with event organisers to set up conventions where cosplay is a main attraction! Top – Cosplay madness in full effect! We work with event organisers to make cosplay a main draw for their convention. We aim to make cosplay a main stage attraction, doing so in the form of a low entry-barrier catwalk, or a more serious cosplay competition. In short – we put Cosplay on a pedestal. 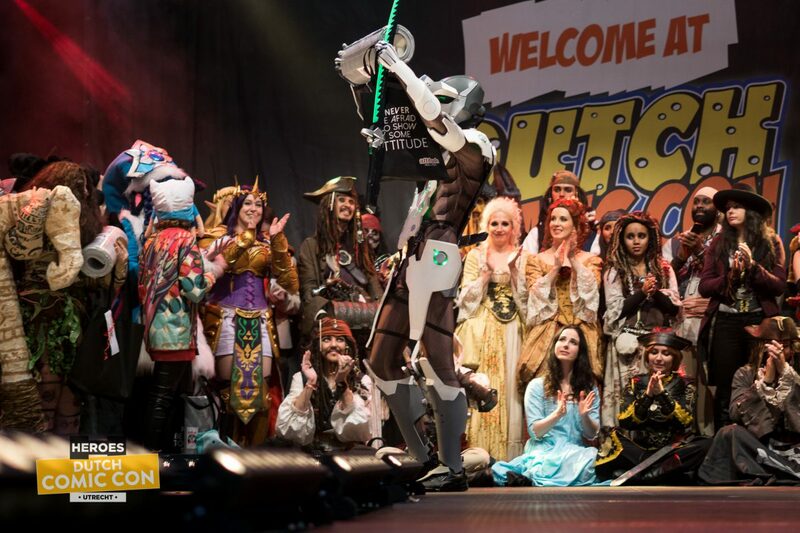 Beyond securing the limelight for cosplay we try to get the community invested. If the cosplay community feels a con is a proper place for hangouts and meets, the event livens up significantly. When the community shows up it means visitors see their favourite heroes and villains walking around everywhere, which makes for a memorable experience. Hype takes the cosplay community very seriously and does everything to remain in good standing with them. When we work with an organiser we try and balance the two: the community needs a place where they are welcome and empowered, and if the organiser provides this the reward will be a colourful explosion of costumed individuals. 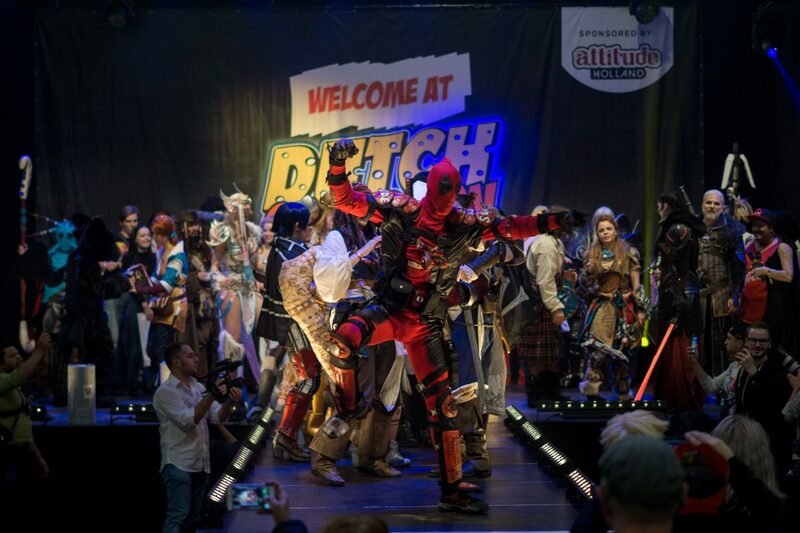 Hype has worked with the Netherland’s Dutch Comic Con intensively. 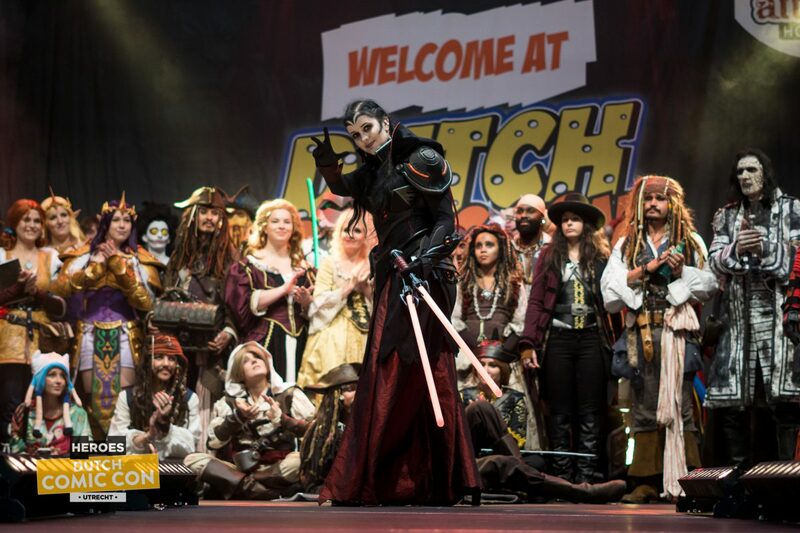 In our opinion Dutch Comic Con is one of the – if not the – leading comic and pop-culture convention of the Netherlands. Together with Dutch Comic Con we’ve set up two events that run on both of their con days. The first is a cosplay catwalk where everyone can display their outfit, regardless of whether they created the outfit entirely, just partly, or not at all. The catwalk is all about having fun whilst being in character! The other event is their by know well-known cosplay competition. This is fun yet serious competition, where contestants fight solo or as a duo to win cool prizes. This event is a real crowd pleaser, as it not only has a ton of great cosplay performances, but also sees our our own Official Unicorn Lover as the comedic host Deadpool, and features an international jury of three cosplay artists to finish things off. 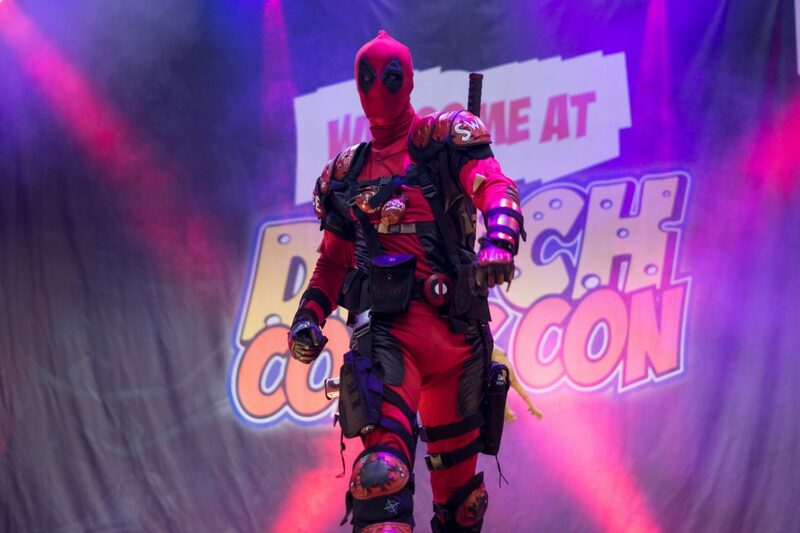 Top – Nothing beats having Deadpool as the host of your cosplay competition!